How many mentos are needed so that Nate can drink from the fountain of diet cola? How many Mentos did it take for the Mentos man to drink the soda? How many Mentos did they throw in? What is the optimum number of mentos that will get the biggest reaction? How many mentos did it take to reach up the bleachers? What would be the maximum height the soda stream could reach? How many Mentos to get to the top of the stage? How many Mentos did they add to make the pressure high enough to touch the top of the bleachers? How many Mentos does it take to reach the top? How many mentos did it take to reach that high?!? How many mentos did they use? how high did it spray? What could I use besides Mentos to make this happen? How high will one mento blow? How many mentos was that? How many mentos were needed to make the pop go that high? How many mentos did it take for Nate to drink the soda? How many mentos successfully got the soda up to the apron dude? How many mentors it takes to make it to the top? How many mento's did it take to reach the guy on bleachers? How high will the pop flow up? Why would he try to drink the coke? It looks like the hole was smaller on the last one, is that right? What was the diameter of the opening on the cap? How many mentos reach up to the man on top? LOLOLOL. I love it. How many mentos DOES it take to reach the top? How many mentos to reach the man? What in the mento causes the erruption? Why did it go higher with the top on? Why the heck would you stick your face in it? what will happen if you put in 100 mentos? How many mentos did they put in that soda? How many mentos would it take to reach over that guy? What soda produced the highest reaction? Did you have permission from Mentos? How high will the mentos go? How many Mentos was the last insert into the pop bottle? How high did the pop actually go? Purpose/circumstances for taking photo - set up? 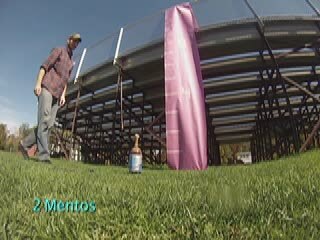 How many mentos does it take to let the teacher in the bleachers get adrink? How many mentos were needed to reach the top of the fence? What was the catalyst for the greater heights? How many Mentos does it take? What's the rate in which 1 mentos shoots into the air?